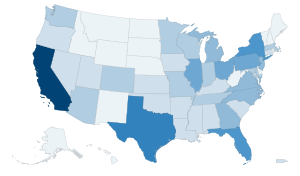 The states and territories included in the United States Census Bureau's statistics include the 50 states, the District of Columbia and five permanently inhabited unincorporated island territories, including Puerto Rico. The United States Census counts total persons residing in the United States including citizens, non-citizen permanent residents, and non-citizen long-term visitors. Civilian and military federal employees serving abroad and their dependents are counted in their home state. Based on data from the decennial census, each state is allocated a proportion of the 435 seats in the United States House of Representatives, although each state is guaranteed a minimum of one seat, regardless of population. This apportionment is based on the proportion of each state's population to that of the fifty states together (without regard to the populations of the District of Columbia, AS, GU, MP, PR, or VI). The Electoral College is the body that, every four years, elects the President and Vice President of the United States. Each state's representation in the Electoral College is equal to that state's total number of members in both houses of the United States Congress. The Twenty-third Amendment to the United States Constitution effectively grants the District of Columbia, which is separate from any state, three votes. More precisely, the district gets as many votes in the Electoral College as it would have if it were a state, with the caveat that the district can have no more votes than the least populous state (which is currently Wyoming). Currently, this caveat is a moot point since the District of Columbia would only be entitled to one member of the House of Representatives if it were a state, and is more populous than only two of the seven states with a single member in the House since 2013. Since the Constitution guarantees every state at least one U.S. Representative and two U.S. Senators, it effectively guarantees every state (and, since the ratification of the 23rd Amendment, the District of Columbia) at least three electoral votes. Thus, the total representation in the Electoral College is 538 members (equal to 100 senators plus 435 representatives, plus 3 members for the District of Columbia).